One thing that you will not see in your glossy ‘Our Auckland’ magazine that graces your letter box once a month is the productivity figures for Auckland. The Auckland Plan target for productivity is that productivity itself increases at a rate of 2% a year by 2042, the end of the Auckland Plan. One small problem for the 13/14 year. We went backwards from 0.25% growth to 0% growth. To make matters even worse is that we missed three other key indicators as well in the economics department as seen below. Council can say what it likes about any other target that was tracking green. But if the main economic targets tracking in red are being missed then we are simply not pulling our weight. And yes I saw the mentions on the Innovation Precinct in Wynyard Quarter that is “led” by Auckland Council (so ratepayers money spent) missing the mark quite widely. Suppose that will be a given when there is no actual robust Key Performance Indicators in place to track what that Precinct is achieving. This compared to a natural evolved innovation precinct in Parnell bubbling along nicely with no public authority help or intervention (hint there). 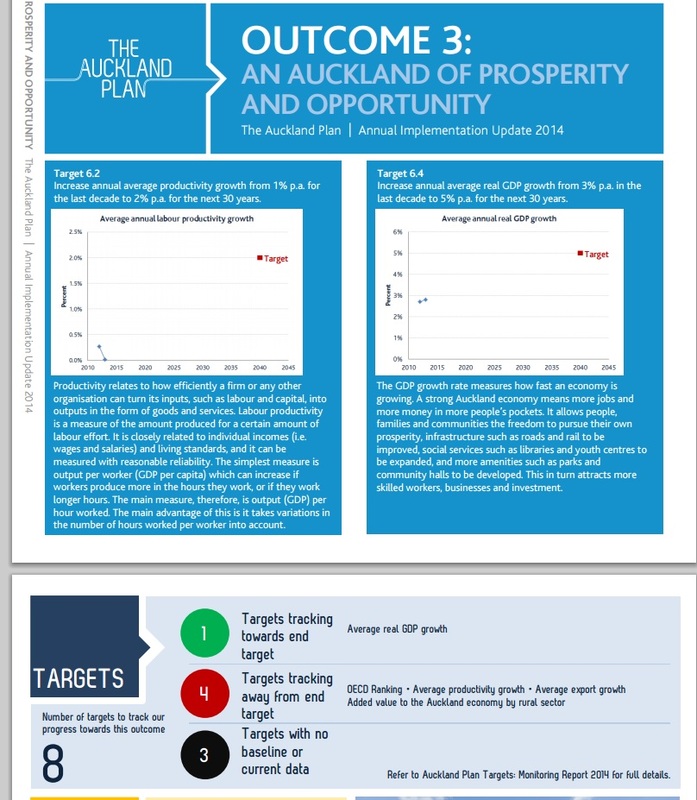 So the question begins to ask what can we do to get productivity back towards the 2% target stated in the Auckland Plan. The Auckland Plan goes for a three yearly update in the second half of this year. I’m no economist, but I suspect it’s harder to measure productivity for a city than for a country. So I’d expect the margin of error in any productivity estimate to be high, certainly higher than the 0.25 percent drop seen here. I’d be interested to hear from someone who knows more about these figures to put them into context. I will contact the Chief Economist later this week in Auckland Council. That said we are due for another update in about August as the three yearly “refresh” kicks off. Productivity relates to how efficiently a firm or any other organisation can turn its inputs, such as labour and capital, into outputs in the form of goods and services. Labour productivity is a measure of the amount produced for a certain amount of labour effort. It is closely related to individual incomes (i.e. wages and salaries) and living standards, and it can be measured with reasonable reliability. The simplest measure is output per worker (GDP per capita) which can increase if workers produce more in the hours they work, or if they work longer hours. The main measure, therefore, is output (GDP) per hour worked. The main advantage of this is it takes variations in the number of hours worked per worker into account. Yes, I read that. It makes sense. I guess you’d need to have fine-grained data to put a meaningful figure on a city’s GDP and to know what workers in the city are earning. Sure, all that information is out there somewhere, but I still wonder how accurate the figures are. Let’s put it this way, it’s not usual for national GDP figures to be revised after publication, that hints at a lack of accuracy. If anything the number for Auckland will be less accurate because the borders around the city numbers are fuzzier than those around national numbers.